UPDATE: Valerie cleaned up these spaces! Go here to see her success story! Today’s messy situation was submitted by Valerie! Valerie, kitchen surfaces are a problem that I’m hearing about over and over again, so you’re definitely not alone! 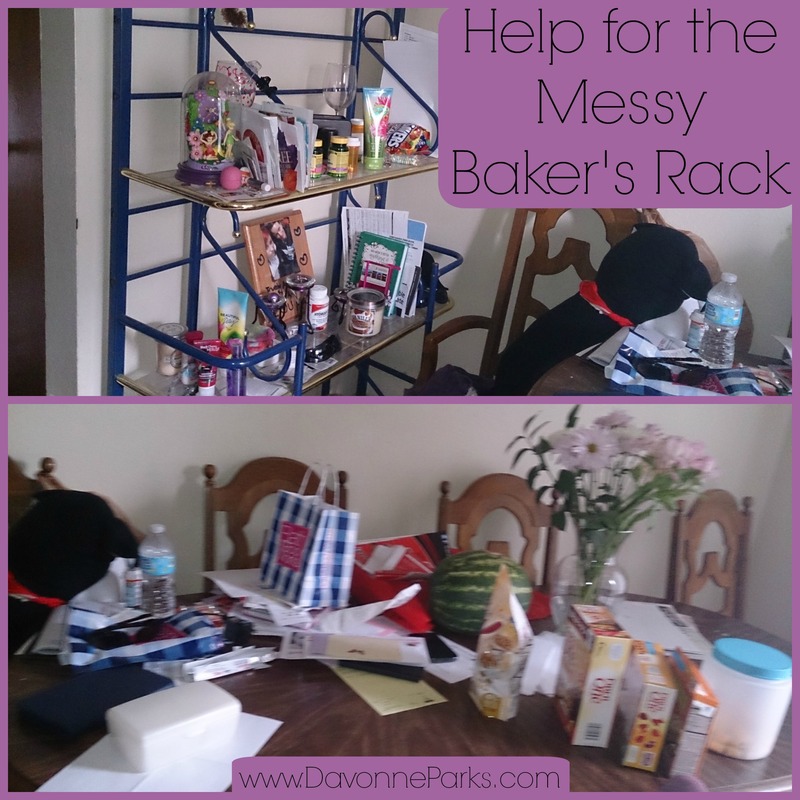 Let me ask you this: do you really need your baker’s rack or has it just become an unnecessary clutter-catcher? I had some clutter-catching furniture in my own house and I found that either taking the unneeded furniture to Good Will or relocating it to a better area in my home helped to solve a lot of that problem for me! If you do need your bakers rack, consider using pretty baskets or bins to hold groupings of things. For example, you could have one basket for incoming mail, another basket for office supplies (pens, paper, tape, etc. ), and another basket for flashlights and batteries. To get a visual idea of how to neatly use baskets on shelves for organization, check out this article I wrote about how I organized my entire home without spending a dime! You’d mentioned that you don’t always know where to put things – I completely understand because I used to have the same problem! The thing is, though, that we’re the boss of our stuff. If you won’t tell your stuff where it needs to be, then nobody will. Work on training your brain to make decisions about those things. Moving on to the table… I can’t emphasize enough the importance of giving yourself a fresh start. Clear off your table and purge absolutely anything that you can. Then make it a goal to eat there once a day because doing so will help you to keep the clutter cleared off on a regular basis. More kitchen help: I recently wrote an article about how to keep the counters clear so make sure to check out that post because it has really great tips! And don’t miss Keri’s excellent post about kitchen organization either – she focuses on the fact that a lot of times, counter clutter is an overflow of cabinet clutter. Keri goes step-by-step through the process of organizing your cabinets so you can keep your kitchen fresh and clean on a regular basis! Since you work an irregular schedule, I also recommend reading this article I wrote about how to keep a clean-enough house even when you’re really busy. I worked an irregular schedule for years and I know that it’s tough to get into a routine – but it is possible to have a decent-looking house even when your hours are continually changing. I hope this helps you, Valerie! Good luck on decluttering your table and baker’s rack! Please send after photos when you’re finished!